Ok, the Dot Collector app looks pretty interesting and distracting. But worth understanding. I’ve never worked at Bridgewater or know anyone that has to get their first hand experience with it. I have attended meetings where I wish we had something of the sort. I’ve also experienced the consequences of uninformed people drown out the reasoning of informed people to make catastrophic decisions. I’ve gotten direct IMs (and even sent a couple) on the side when someone says something that isn’t believable. Leadership is often graceful confrontation of such situations to ensure mistakes aren’t made. I believe deep down, especially in our professional lives, we all just want to get to the best answer. There are certainly egos and feelings at play, but in my experience if you can argue against one’s idea without making them feel dumb or cornered, it brings you closer. Really. In the end accepting the wrong answer negatively affects everyone involved. At a minimum, there may be work you have to go back and re-do, at the maximum they have the potential to tank the company. A software solution to systemically prevent this sort of thing from happening is intriguing. I searched for the dot collector app on iTunes or some knock-off variant but couldn’t find anything. I went on to listen to Dalio’s Principles book. It’s a fantastic management manual that I’d highly recommend. His organization of thought and detailed principles for both work and life are enlightening. It had been a couple of months since I searched for the dot-collector app so once again I looked and found nothing. I sent a note to Ray to see if he’s planning on licensing this, no word back yet. 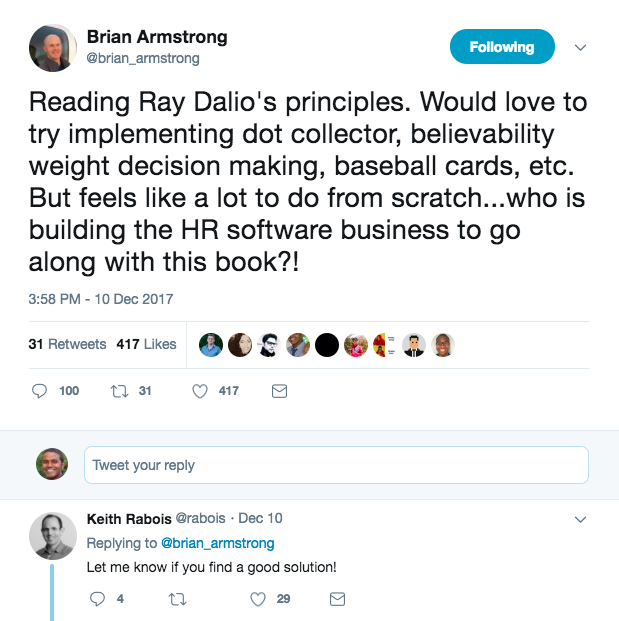 Then I came across Brian Armstrong (CEO of CoinBase) + Keith Rabois (entrepreneur, investor, contrarian) mentioning that they too were looking for this. How hard would this to be build? I went and watched the video again. I found myself watching the people in the video as much as the software. In all my years in tech (big company and small) I’d never been in a meeting with microphones, people sitting behind other people. It looked like a congressional hearing. Most discussions in Silicon Valley happen on Slack… Many of the in-person meetings I attended were rehashes of discussions on slack or getting others up to speed on what was already decided. Rather than force adoption of a new app for people to use during a meeting, why not build this directly into Slack… Everyone is on there all the time any way. 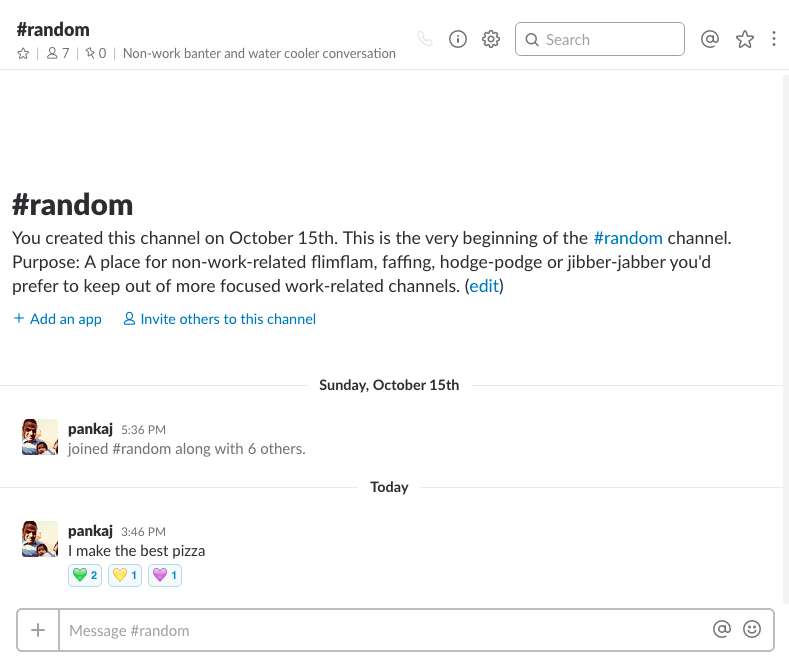 I opened up Slack to envision how this might work. Should this be an app that the admin needs to install? Would a user have to remember to call “dot collector”to start it for certain discussions? How do you make the feedback real time without taking away from the discussion? Is there a panel somewhere with all the dots across the discussion? 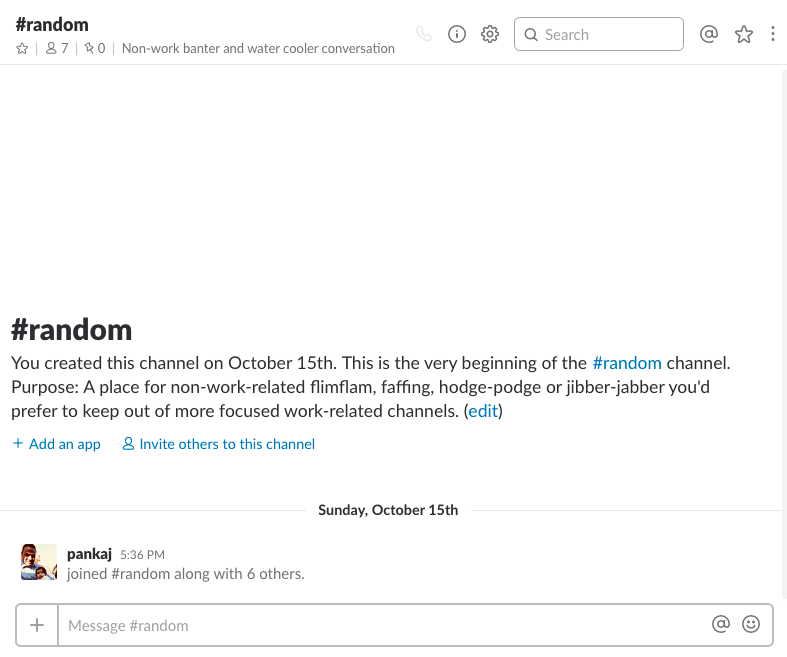 Then it hit me that there is a simple hack to start being radically transparent already built-in to Slack. As a matter of fact, most people are already doing some form of this implicitly with emojis. All you have to do is formalize it a bit. 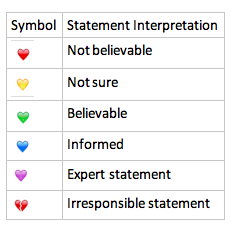 The quick, no install of plugins or forcing adoption of something new to get started being radically transparent is simply to come to an understanding of what emoji symbols mean what. Select the “dots.” Any set of emojis will work, I like the hearts because well… Love and the first 6 are the same symbol so you can use the color to denote meaning. Select the one that best reflects how you interpret an im-ed statement. Here is a simple legend based on what I saw in the TED video. Keep it simple. The actual dot collector used by Bridgewater has employees grading one another on multiple dimensions and uses an algorithm to make sense of it all. 30 years in, I’m sure they’ve hit a point of sophistication where it’s justified. For the rest of us, lets walk before we run. Depending on how your company experiments, it probably makes sense to talk to your manager about doing trying this with your team. Watch the TED video as a team. Openly talk about up leveling discussions by practicing radical transparency. Go over the above legend, come to a collective understanding of the use of each symbol. Explain that no one is believable 100% of the time on everything. If you find yourself getting called on something keep it civil. If it really bothers you reach out to the lead to work through it. Commit to one another that you won’t start or fuel an escalating unproductive/emotional IM stream. Time box it to 1 week. Start on a Monday, end on that Friday. As the advocate for radical transparency you may find yourself being the one that needs to hit the believability emoji on most discussions to encourage others to participate. Check progress. Are your team members doing it? Is the level of discussion elevated? Do people see it being productive? In the following week team meeting, prompt team members to talk about their experience. Did it make the discussions more productive? Did it help you get to the best answer? Did people learn more faster? 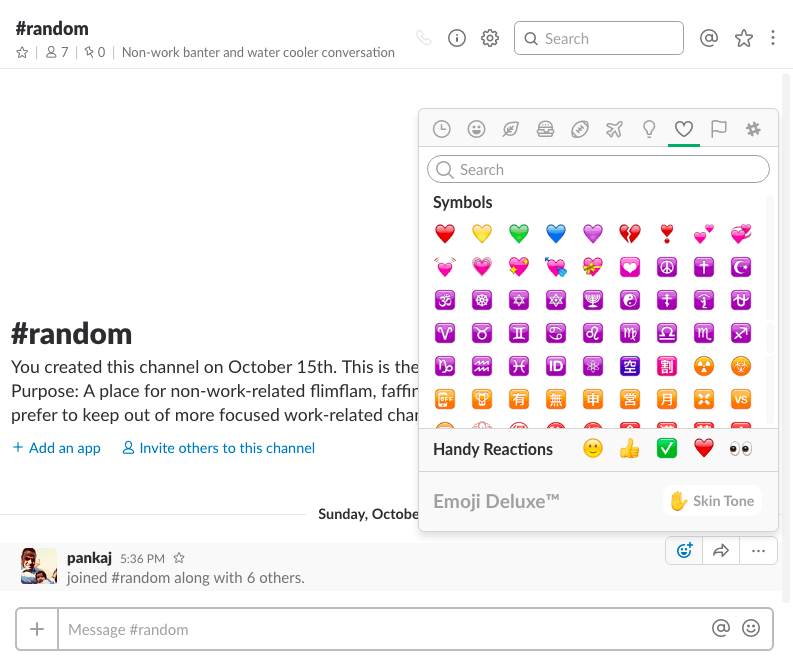 Refine the understanding of emojis and commit to doing it again for the week. Repeat the time box and steps within the week. I suspect that in week 3 or 4 depending on how long it takes for people to come to the collective understanding on symbols and consistent use you see productivity gains. Or not. I’m interested in hearing anyone that tries it and how it goes. Post comments!